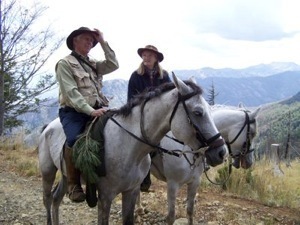 Robin Hanbury-Tenison, "the doyen of British explorers", and his wife Louella have made a ride across Albania. Not content with making the first land crossing of South America at its widest point, leading twenty-four expeditions and being awarded the Patron's Gold Medal by the Royal Geographical Society, making four Long Rides and writing books about them, the ever-energetic Robin made the first modern ride across Albania with his wife Louella. Robin and Louella were riding in the hoof-prints of British Long Rider Lord Byron. October 2007 - Robin and Louella have completed their journey! Here are a few extracts from Louella's journal, but for more information do visit visit Robin and Louella's website. For more information about the film which is being made, please click here. Albanians are with one hand very unhelpful, unwilling and loath to look one in the eye, and with the other hand they want to fill you up with raki and give you wholehearted hospitality. Just when we were in despair a lovely farmer agreed to help us and Skender Imeraj, his wife Spahe, daughter Anila and sons Edison and Erlis took the horses, pegged them out in their field, and filled our glasses with raki in their tiny cottage. These people live with limited electricity, a stand pipe in the yard, a small dark sitting room and perhaps two small rooms where the family sleep. In winter conditions must be very hard as they have snow here for six months a year. The houses are incredibly basic but well swept and clean, and hospitality is offered with genuine warmth. I am sure they would happily give a guest their last crust of bread and be proud to do so…..
Our ride up over a stoney pass and on to the next hamlet of Kan was horrible as sheet rain and cold swept over us and we were wet to the bone, yet again, in moments. We sheltered in an abandoned building, once a hospital but now without doors or windows and full of animal and human excrement. While we changed from soaking clothes into all our spare clothes, Tonio and two small boys broke up the last remaining window ledges and made a fire in one of the rooms…..
We have had 6 days now and each day has brought its joys and it’s disasters. The horses are not very fit and are very tired and unwilling. We spend most of each day leading them as we have to climb huge mountains to cross over the passes and down into the next steep valley. It is totally not possible to ride. The paths and roads are very stoney which is horrible terrain for horses and us. For fifty years Albania was closed to the world. Now it is open, but few visit. Starting in the Balkan Peace Park, Robin and Louella have ridden pure-bred Albanian horses the length of Albania. It was a journey of discovery and a passage through history as he tells the story of this extraordinary, beautiful, and troubled land, and goes in search of Europe’s last ethnic peoples. To read about previous Long Riders in Albania, please click here.